It is, perhaps, the most appallingly bad epic poem to have ever been written in English, comprised of 384 interminable pages of doggerel verse devoid of any literary merit, an opus d'odure that screams stinkburger. 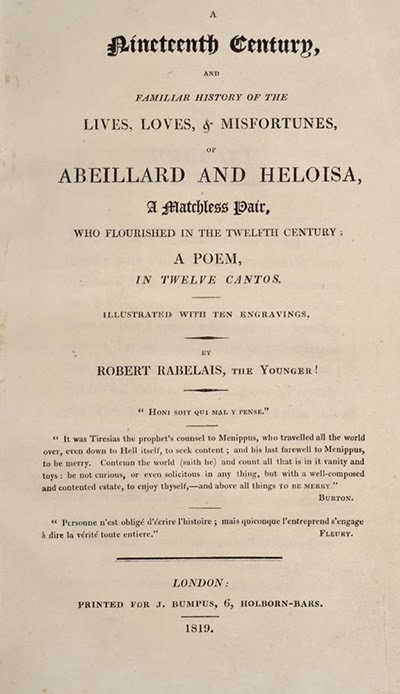 Introducing: A Nineteenth Century, and Familiar History of the Lives, Loves, & Misfortunes of Abeillard and Heloisa, A Matchless Pair, who Flourished in the Twelfth Century: A Poem, in Twelve Cantos, published in London by J. Bumpus in 1819, and written by "Robert Rabelais the Younger!" Rabelais the Elder, who requires no exclamation point, must surely wish, wherever he is, that Gargantua and Pantagruel squished the Younger under their feet before he co-opted Elder's reputation and committed "horrible and terrifying deeds and words" associated with Pantagruel but here applied to poetry and western civilization's most tragic love story. But why take my word for it? Contemporary critics flayed the pseudonymous new Rabelais and his creation. "But it is seldom that our patience has been more severely tried than by the volume before us. Ten thousand lines of stupid doggrel! Why, the Job or Griselda is unborn who could perform such a labour as their bona fide perusal! A page is a punishment for naughty boys at school to repeat in expiation of any offense, and six pages would be penance enough for the utmost mischief that ever luckless and unsteady wight committed. We would recommend the book to teachers for this use; but we are restrained by the little dull obscenities it contains, which might perhaps do no good to the morals of the rising generation. Not that our modern Rabelais is worthy of the name he assumes, even on the score of impurity: he is equally free from the piquancy and the wit of his prototype; guiltless alike of his learning, his humor, and his genius, and far distant from that grossness which he durst only imitate in modern days. "Conceiving this book to be as pernicious as it is tiresome, we deem it our indispensable duty to enter our early protest against it, especially as its title and some pretty engravings are calculated to catch the general eye. Burlesques and travesties, to be at all tolerable, must in the first place be founded on a great preceding subject; in the second place, be not too much prolonged; in the third place, be witty; and in the fourth place, form entertaining associations of ideas with the original. 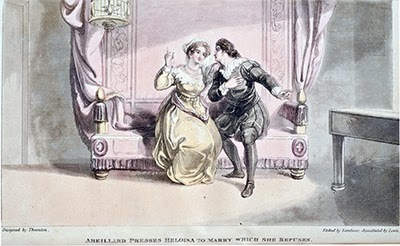 In all these requisites this Abeillard and Heloisa is lamentably defective. Its ground work is barely sufficient for a few pages of parody…and could not, with fifty times the writer's talent, be endurably spun out to twelve long cantos. Of wit there is no particle, and of ludicrous association with the ancient tale we can discover no traces. 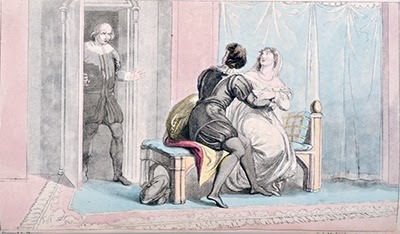 "…How then could this Mr. Rabelais the Younger hope that his trash could meet with public approbation or encouragement? - trash which has nothing to recommend it, but is as soporific as it is paltry, as senseless as it is tiresome, and as destitute of point as it is trite and unmeaning. "We do not think it necessary to give any further account of such a piece of ribaldry, but shall subjoin merely one passage, taken at random, as an example of the whole tissue of stuff. To pass o'er matters we don't like! A truth so great, it all must strike. Which much vexed her, and made him stare. "Eheu jam satis! - How would readers like to read four hundred pages of such wretched buffoonery as this, none of it better and much of it worse? We claim their gratitude for having done so much for their sakes, and with only the sensation of pleasure this volume has occasioned us, consign it to the trunk-liners and pastry cooks" (The London Literary Gazette and Journal of Belles Lettres, Arts, Sciences, etc. Vol. 3, No. 104, January 16, 1819). "The title-page is characteristic. It would be impossible for good sense, wit, poetry, or excellence of any description, to proceed from such an introduction, as for Champagne and Burgundy to inhabit the house where 'porter, ale, and British spirits,' flare and float upon the sign in front. Not that we are disposed to pursue our comparison; we have too much respect for our house-brewed liquors to liken them to the vapid, vulgar, and disgraceful stuff which is here summated to our taste. "No words of contempt are indeed adequate to stigmatize, with dire force, this labored mess of stupidity. We scarcely recollect a grosser instance of the general abuse of the press. Here is a thick, well printed, octavo volume, without one ray of intellect beaming through any part of it: reams of verse, without the shadow of versification; deluges of English, and not a sentence of the language properly so called. The befell, the crier, and the common hangman, are the only critics of such a performance; and we quit the task in utter disgust. The idea of illustrating such a thing with engravings…could never have conceived but in times of unmeaning extravagance. "Let our readers justify our severity by enduring one extract - better than hundreds of lines in the book. She ate them all red hot, by goles! "The author of these verses would fain assume to himself the character of a wit; and in order to persuade his readers that he is so in reality, he calls himself Robert Rabelais the Younger. We must, however, undeceive them on this point, as he does not happen to possess one single spark either of the wit, genius, or vivacity of the writer whose name he has so impudently pilfered for his title-page. As for his poem, we venture to pronounce it the vilest and most contemptible bunch of doggrel that has appeared for many years, having no one redeeming point to save it from unqualified condemnation. It is at once trite, dull, and obscene: and so far from becoming the hot-pressed pages of a guinea volume, would disgrace the penny pamphlet of an itinerant hawker" (The New Monthly Magazine and Universal Register, Vol. XI, No. 61, February 1, 1819). Aside from the fine printing of W. Wilson, the ten delicately hand-colored aquatint engravings are the only saving grace to the book. 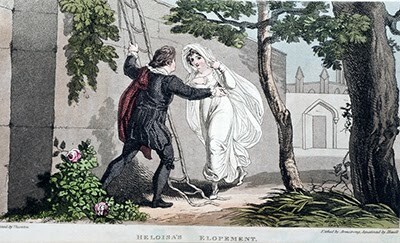 Designed by John Thurston, etched by Thomas Landseer (brother of Sir Edwin), and aquatinted by George Robert Lewis, their quality stands in such stark contrast to the poem that it's as if Helen of Troy was kidnapped by a Neanderthal with delusions of handsome, or a Dior gown was draped on a ditch-digger. The identity of Rabelais the Younger! remains a mystery. I suspect that if the poem had been well-received his real name would have surfaced if for no other reason than he could bask in the plaudits. With these reviews, however, he likely dug himself a hole and jumped in. Can the publisher, J. Bumpus - a canny businessman who began as a bookseller and built his business into J. and E. Bumpus of Oxford Street, an esteemed London department store - have really seen merit in the Younger's work? It seems unlikely. My guess is that the Younger (who I suspect was a man of means and amateur litterateur with the leisure time to devote himself to the reader's ordeal) underwrote the cost of production and Bumpus was happy to take his money and publish the book at no risk. Many if not most writers are driven by the notion, however crazy and grandiose they know it to be, that what they are doing is great work that the world needs to read. It's a necessary fantasy to keep from quitting during those times when it seems that the work is a waste of time that no one will care about. Judging from the feral exuberance of the poem, Rabelais the Younger! appears to have been in a compulsive manic fugue state during its composition, carried away by the wonderfulness of his own writing: this was it, the greatest satiric epic poem since Pope's Dunciad. Rabelais the Younger! could have used a dose of Lithium to get through his mania. Readers will need a Valium to get through the book.